WMAP Seven-year Paper Figures, B. Gold, et al. Comparison of seven-year masks to five-year masks. At the top KQ75 and KQ75y7 are compared, and at the bottom KQ85 and KQ85y7. Green regions are masked in both the seven-year and five-year masks, yellow regions are newly masked in the seven-year masks, and red regions were masked in the five-year masks but no longer in the seven-year masks. 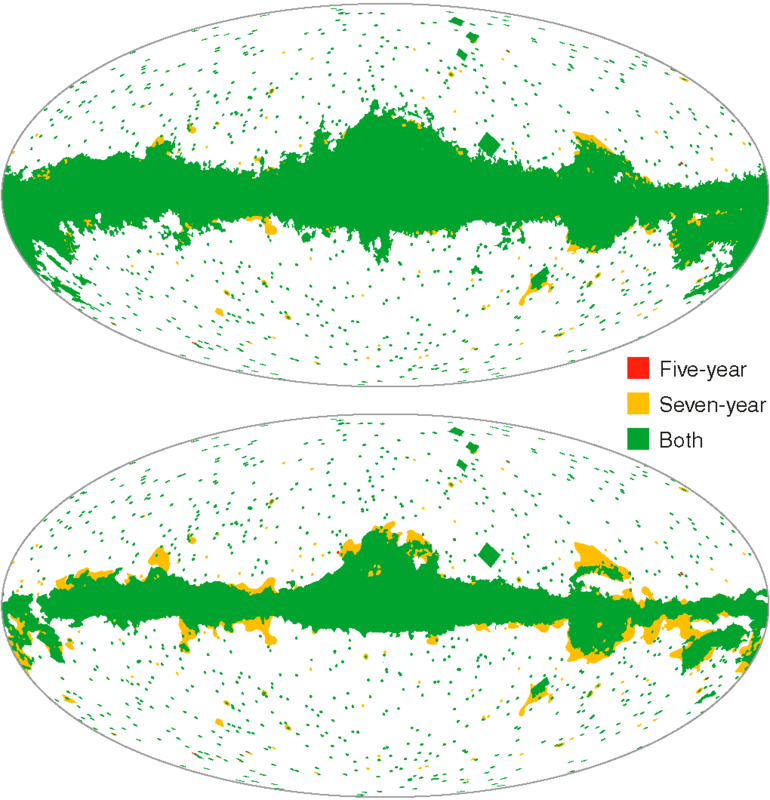 Difference map between the seven-year ILC map and the five-year ILC map. Smallscale differences are consistent with pixel noise; large-scale differences are consistent with a change in dipole of 6.7 µK. Galactic signal component maps as determined by the Maximum Entropy Method (MEM) analysis. On the left are the input prior maps, and on the right are the output MEM maps. From top to bottom are the synchrotron, free-free, and dust components. While the output maps show many features of the prior at higher latitudes, there are clear differences in regions of strong emission. 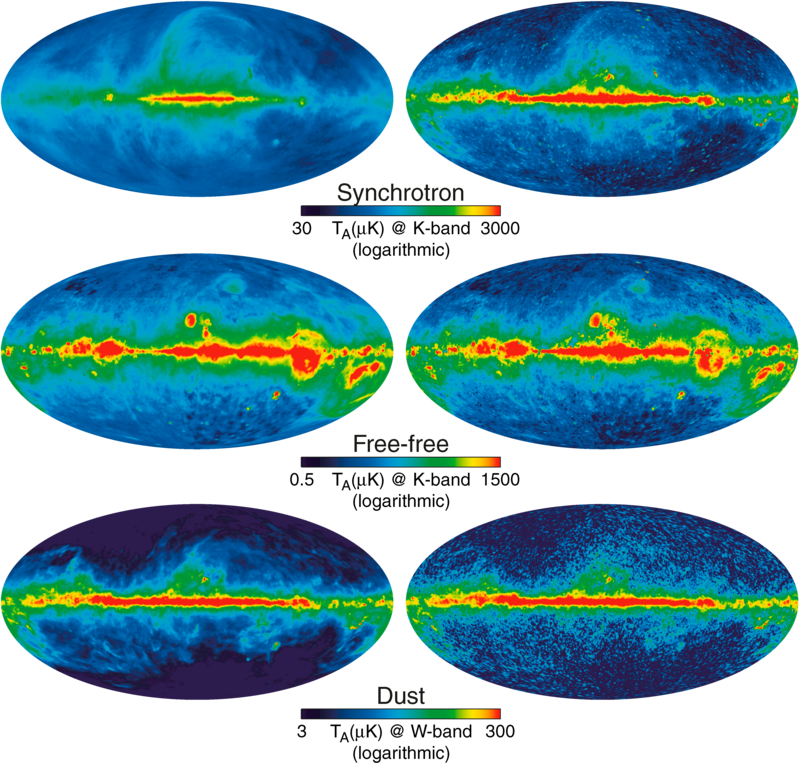 Difference maps between the seven-year MEM foreground maps and the five-year MEM foreground maps. 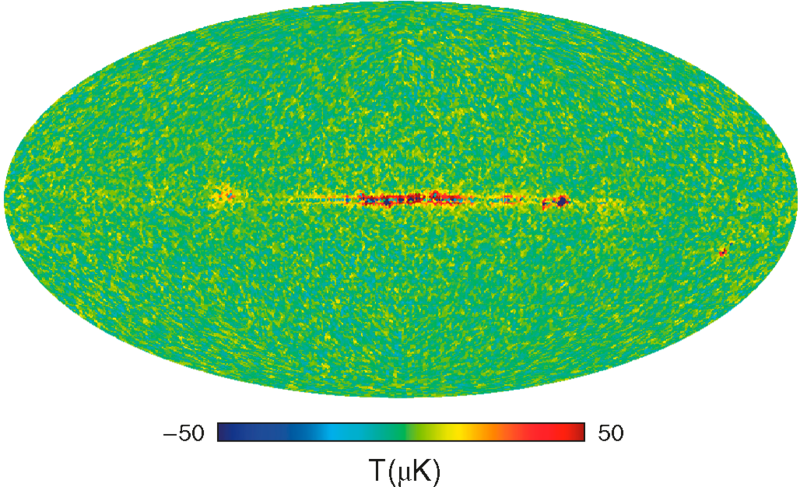 Apart from a small dipole shift and noise fluctuations, the only visible feature is a small shift of 0.17% of K-band flux from free-free to synchrotron. 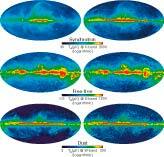 Galactic emission from two regions in the Galactic plane. ARCADE (triangles), WMAP (stars), and 408 MHz data (square) are all shown, smoothed to a common resolution. Upper panels show antenna temperature (absent a monopole component). 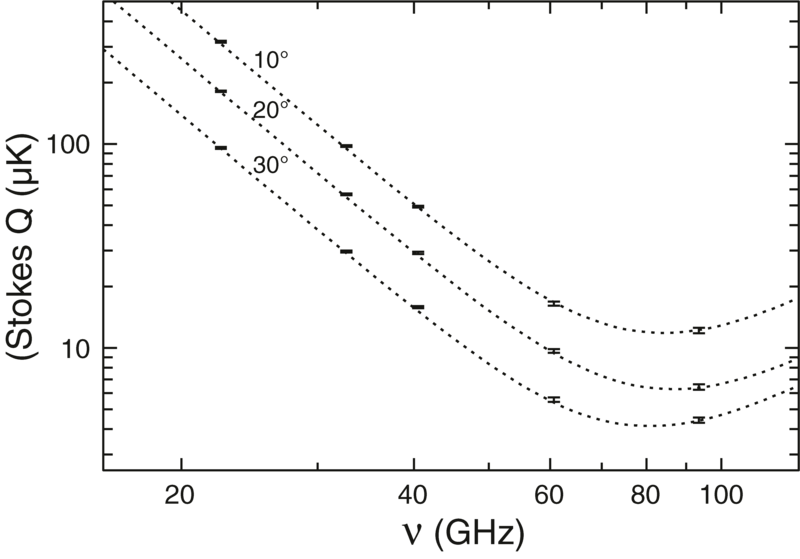 The black line is a power-law connecting 408 MHz to 22 GHz (β = -2.48 for the left panel, β = -2.41 for the right panel), which is divided out in the bottom panels to better show deviations from power-law behavior. Red lines show the result of a fit to the data using three power law components for foregrounds (representing synchrotron, free-free, and dust). Blue lines show the fit resulting when an extra component representing spinning dust is added. Solid lines show the total flux, with individual components shown by dashed lines (synchrotron), dotted lines (free-free), and dot-dashed lines (dust plus spinning dust). Errors in the data are dominated by systematics and highly correlated between data points, but are estimated to be 5 - 15%, depending on experiment. Power spectrum of the difference between foreground-reduced maps. 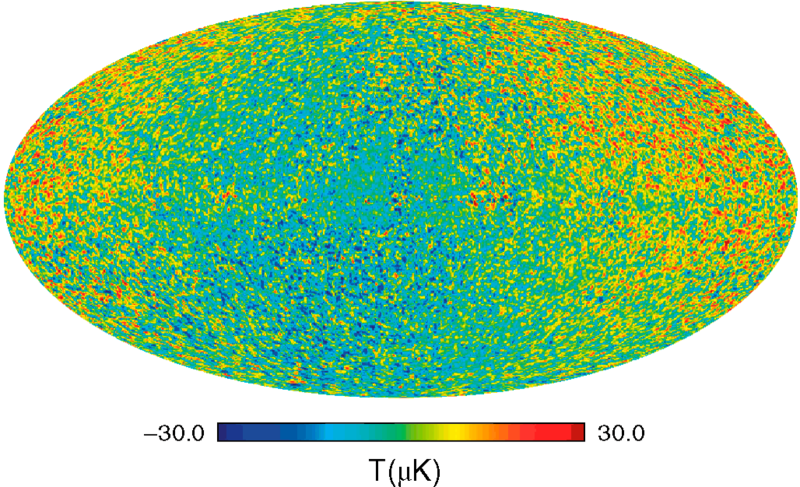 Q-band minus W-band is shown here, with a point source contribution subtracted off. Note the changing scale between panels. Red points with error-bars are averages over bins with Δl = 50. Deviations from zero are below 100 µK2 outside the KQ85y7 mask, and the upper bound to foreground contamination in the foreground-reduced maps is 15 µK. Power spectra of polarized foreground components as determined by the MCMC model. On the left are ClEE and on the right are ClBB; for foregrounds these should be of comparable magnitude. 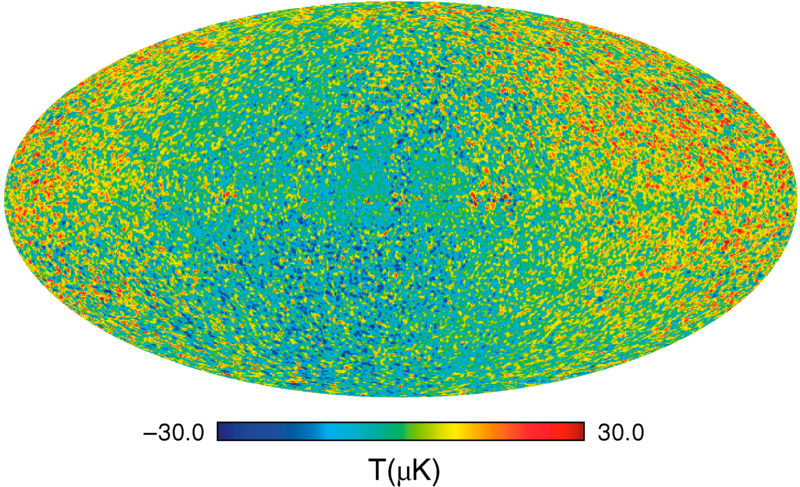 The black dotted lines are the foreground fit to raw three-year WMAP data from Page et al. 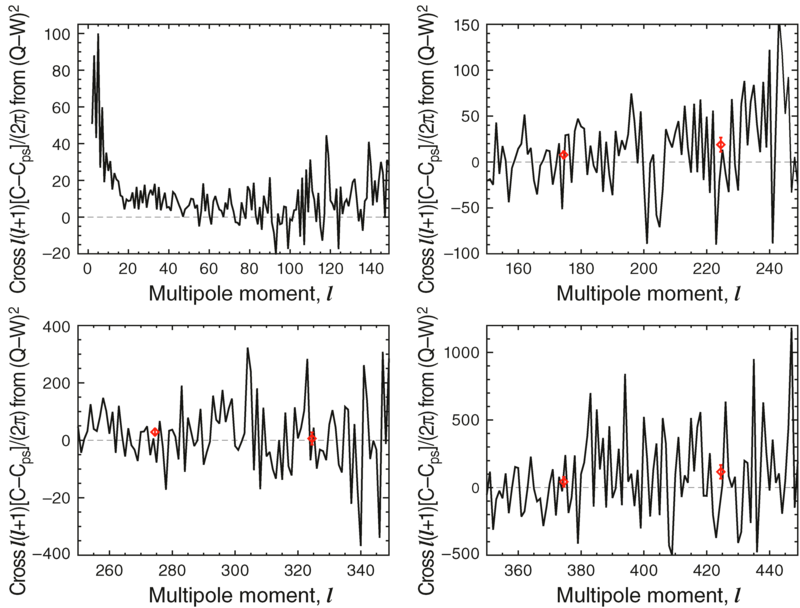 (2007), and the red dotted lines are the combined foreground and noise fit to MCMC maps from this work, with coefficients given in Table 4. Synchrotron results are in good agreement with the previous analysis. The seven-year dust results spectra appear to have a higher amplitude, but the signal-to-noise for l ≤ 10 is 2.8 or less for dust. Comparison of the templates used for polarization cleaning to a low-resolution (Nside = 16) MCMC fit to polarization data using a three-component model with fixed spectral indexes to search for any hard synchrotron component. The left column shows the results of the MCMC fit to polarization data using three components: soft synchrotron (β = -3.1) at top, hard synchrotron (β = -2.39) at middle, and dust (β = +2.0) at bottom. For comparison, the right column shows the templates used for polarization cleaning: synchrotron at top and middle, and dust at bottom. All plots are of polarization intensity P = √Q2 + U2, with a logarithmic scale from 1 to 100 µK. Synchrotron intensity is measured at a reference frequency of 23 GHz, and dust intensity at 94 GHz. The MCMC maps are noisy, and have been corrected for a noise bias in P caused by noise in Q and U. 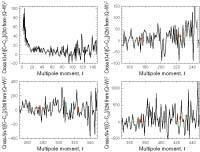 Excess noise in the plane of the ecliptic due to the scan pattern is also clearly visible in the MCMC fits. Given the noise level, hard synchrotron emission does not appear to be significant. Frequency spectrum of polarized emission around the Galactic center. 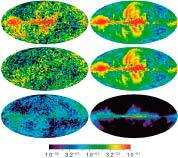 Average antenna temperature of Stokes Q is shown for three oval regions defined by √l2 + (2b)2 < 10°, 20°, 30°, where l and b are Galactic longitude and latitude. Stokes U is negligible at all frequencies except W-band. Errorbars indicate statistical uncertainty from the diagonal part of the pixel-pixel noise matrix. Dotted lines show the sum of a synchrotron component with β = -3.2 and a dust component with β = +2.0; in all cases this two-component model is sufficient to explain the observations. 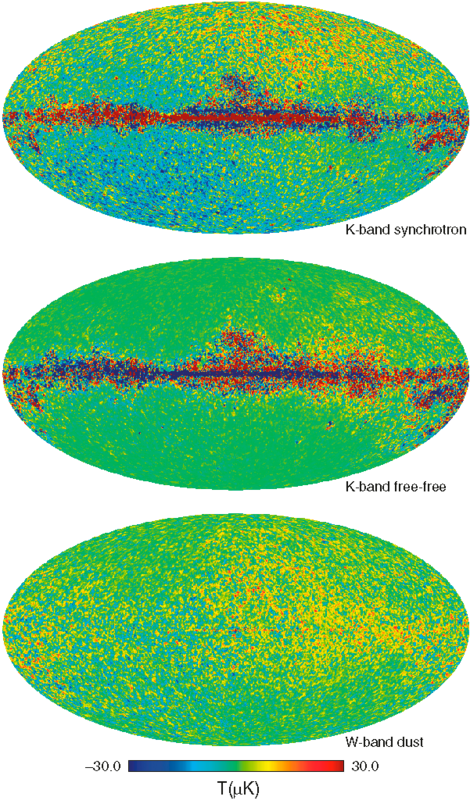 Comparison between a simulated input sky and the resulting maps after scanning and map-making. K-band is shown; differences in other bands are at least 4 times smaller. The only visible structure, along the Galactic plane, is entirely consistent with residuals from gain reconstruction within the quoted uncertainties (0.2%). Comparison between the input foreground spatial and spectral behavior and that recovered by the MCMC fit. Upper left: difference between MCMC result and input Ts+Tf. Upper right: difference between MCMC result and input Td. Lower left: difference between MCMC result and input βs. Lower right: difference between MCMC result and input cs. The main feature is that the simulated synchrotron model contained more steepening in the synchrotron spectrum than the model allowed for, which then biases the recovered βs by 0.2 in high signal-to-noise regions. 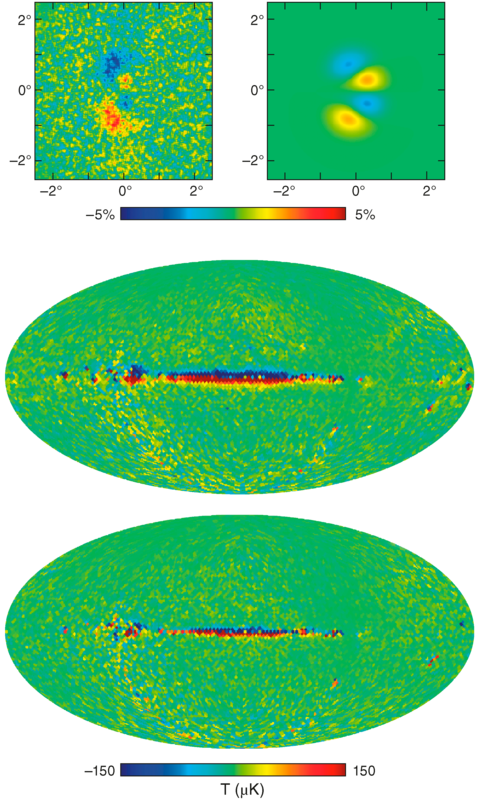 The apparent bias off the Galactic plane only occurs where the signal-to-noise is low and the parameter error is larger than the bias. Flight data and a simple model for differences between maps made with six months of data and those made with a full year. Top left: difference between observed K1 beam and 180° rotated K1 beam (scale is ±5%). Top right: difference between a model beam consisting of a sum of Gaussians and its 180° rotation. 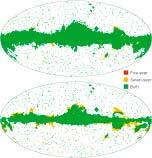 Middle: observed difference map between six months and a full year for K-band. Bottom: simulated difference map created using the beam of the upper right panel. While this simple beam model doesn’t completely resemble the observed beam, it qualitatively reproduces the effects observed in the maps. 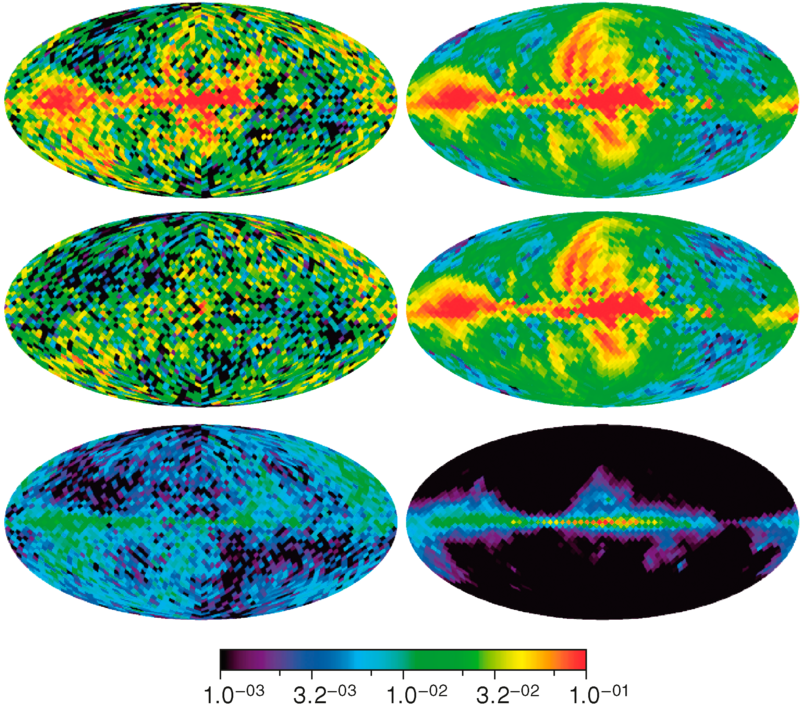 Effect of beam anisotropy on the MCMC foreground fits, using stacks of six month maps. Pixels near the boundary of the six-month scans are masked (gray) due to poor coverage. 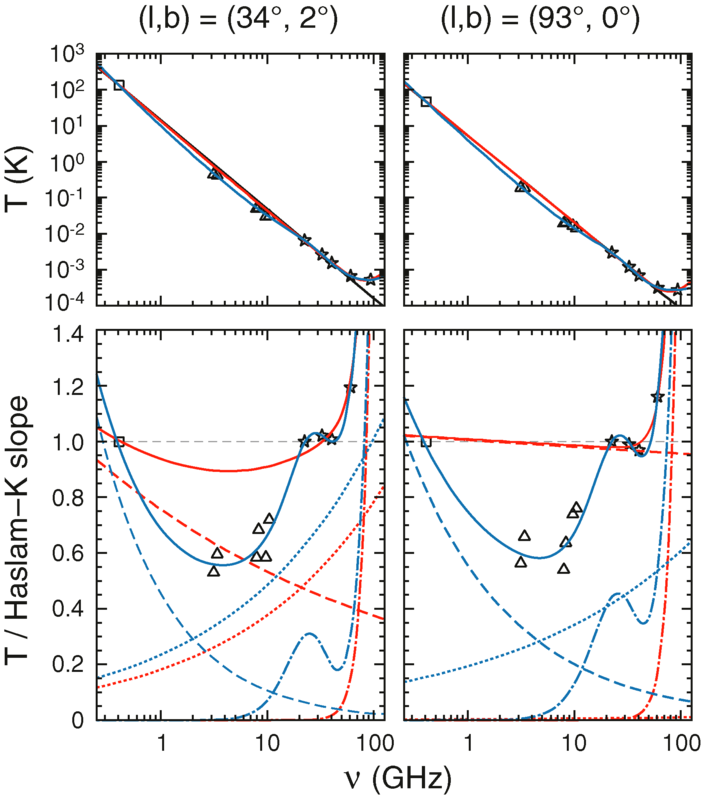 Top left: difference in MCMC synchrotron temperature. 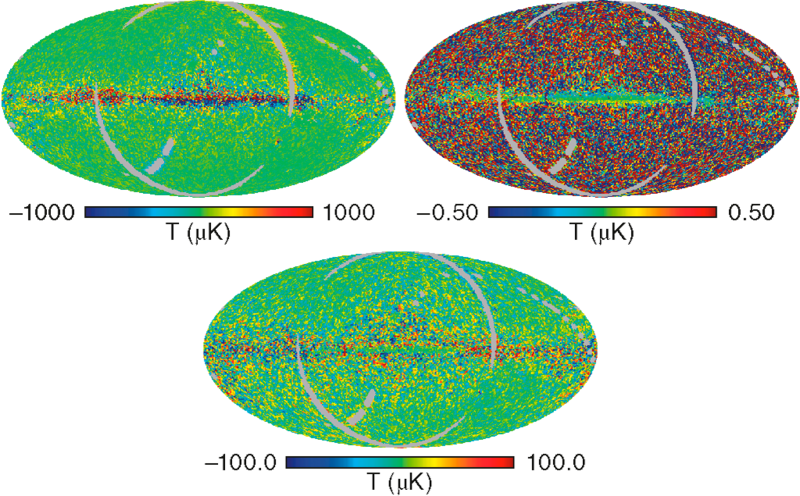 As the combination of synchrotron and free-free is largely constrained to match K-band, the free-free difference is nearly the opposite of this map. 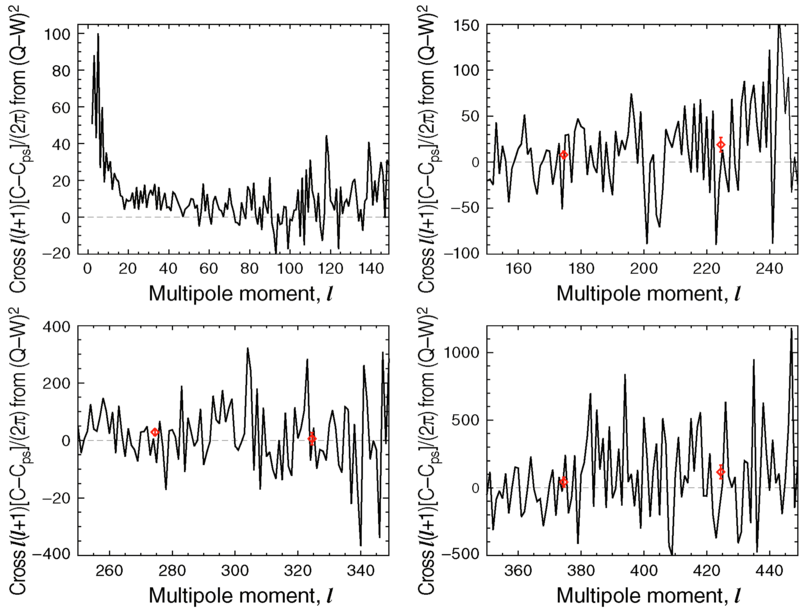 Top right: difference in MCMC synchrotron spectral index. 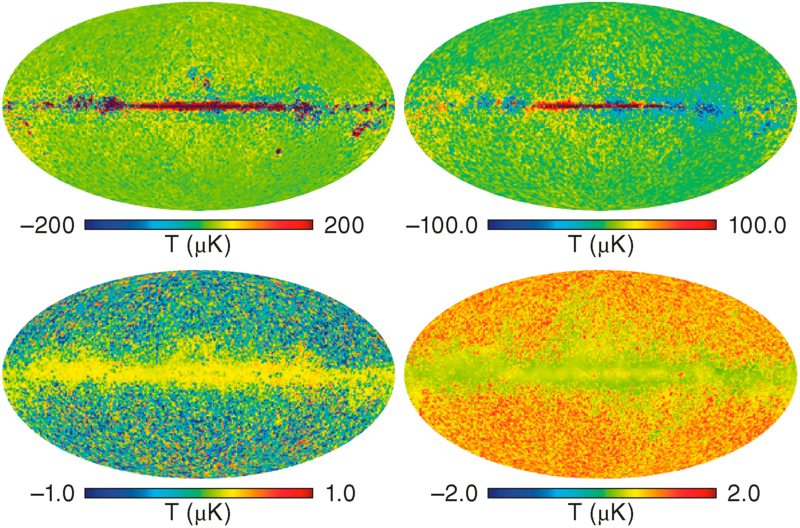 Away from the Galactic plane this map is mostly noise, but a slight gradient with Δβs = ±0.1 is visible near the plane. 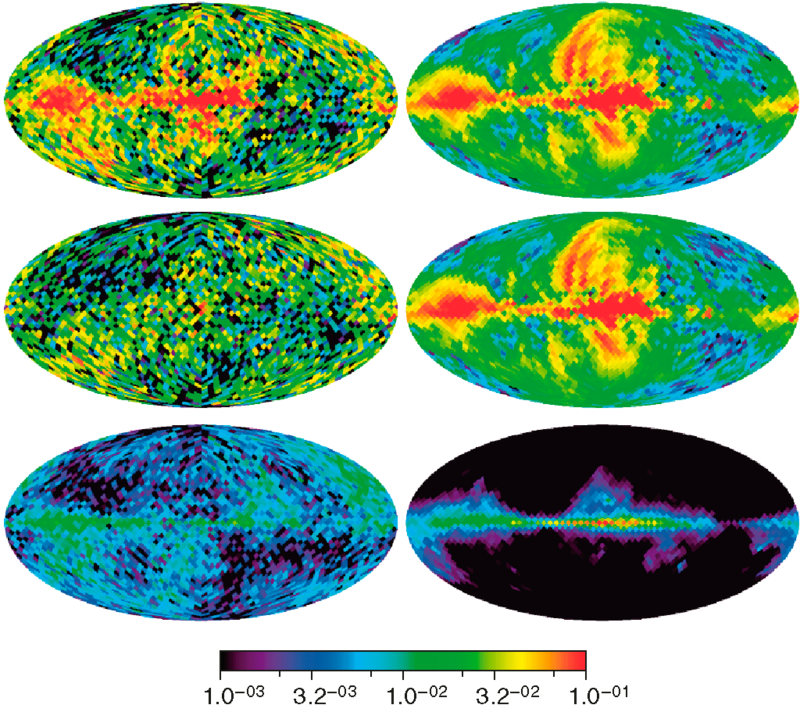 Bottom: difference in MCMC CMB temperature. 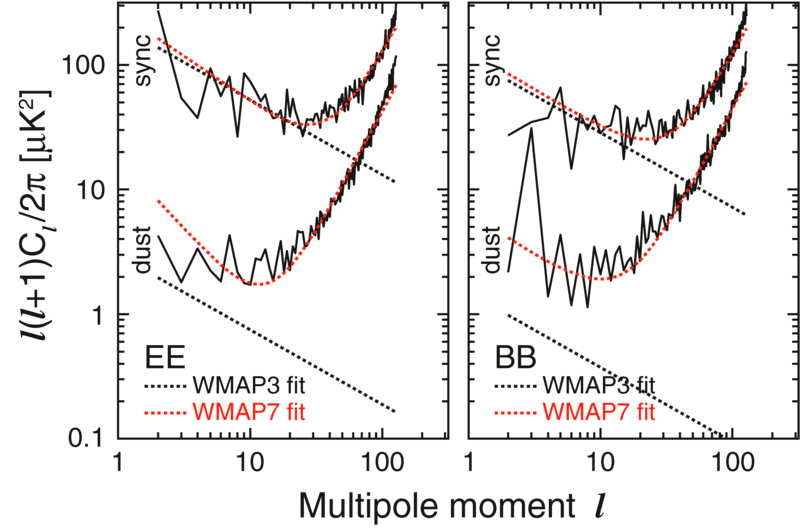 Most of the variation is noise in the MCMC dust model, rather than due differences between the six-month maps.